Happy 70th birthday to the Glasgow Odeon Renfield Street - it opened as the Paramount on Hogmanay 1934. A couple of photos of recent developments at the Kingsway in Glasgow have been added - it seems the developers were seeking permission to demolish the building last week on public safety grounds, but were only allowed to 'make safe' the building by cutting down some of the pediments and pull off some loose render on the facade. More news as we get it. Thanks to Hugh Thomson, some archive photos of the Regal and Queen's cinemas in Stirling are now available. Interior pictures of the Cameo in Edinburgh have been added, as well as interior photos and detailed information on the Dundee CCA, thanks to Pete Naples. Stuart Kelly has send a large gallery of interior photos from inside the Haymarket cinema in Edinburgh, as well as some photos from the last night of the Odeon Clerk Street. Thanks to Gordon Adams of the marvelous www.eastglasgowhistory.com website, we can show you some archive photos of the Orient when on bingo, and on the Demolished Glasgow cinemas page, the Dalmarnock and the Strathclyde Picture Houses. Thanks to David Low, have added some additional photos to the Elgin and Callander pages. Added the Albert Hall / West End to the Edinburgh cinemas page. The long gone Hippodrome / Ritz in the Gorbals is now featured on the Demolished Glasgow cinemas page, thanks to Norrie Mcnamee. A photo of the staff of the Allanpark cinema in Stirling on opening night in 1938 was kindly provided by Stewart Donaldson. Thanks to John Millin, have added lots of information and an archive photo of the original facade to the page for the Cumnock Picture House, where he was a projectionist for many years. He's also kindly provided information on the cinema in Auchinleck, which has been added to the database (and hence the to-do list - does anyone know if this building still exists or not?). Added new photos of the Pavilion in Dumbarton, thanks to Emma Watson, who also has a great page with cinemas in Maidenhead here. Pete Naples has kindly sent some photos of the surviving projection equipment in the long derelict A-listed Hippodrome in Bo'Ness. Two archive photos from Campbeltown in the late 1970s have been added thanks to Frank Watson - one of the Picture House, and one of the demolition of the Rex. Information about the Abbey Cinema in Mauchline has been added to the database thanks to Ron Tannock. The page for the Bombay cinema in Glasgow (formerly the Capitol) has been updated with new photos, some new close ups showing the current dilapidated state of the Lyceum in Govan, and a photo of the current state of the retained facade of the Toledo / ABC Muirend have also been added. Right, that should be everything restored and working again! Now for some news and updates from the last week. Historic Scotland have granted permission to completely demolish the derelict B-listed Kingsway cinema and put housing on the site. A power surge on the morning of 6th December knocked out the machine that hosts this website. We've recovered everything up till the 27th November, but some updates made after that have been lost. They will be gradually recreated as I work my through them in the next day or so, but in the meantime, unavailable updates appear in light grey below. Everything else, including the database, should now be ok (hopefully!) - though please let me know if you spot any other problems or anything missing. Also, if you have sent me any emails between the 27th November and the 6th of December, can you please resend them, as anything from between those dates has unfortunately been lost. Thanks for your patience over the last few days! Updated the Olympia page with photos from yesterdays fire. Todays Evening Times also has an updated story on the fire. Added a previously missed cinema to the Edinburgh page - the Star in Canongate. Added a more recent and improved photo to the Grand Central page in Glasgow, and upgraded and enhanced the page for the ex-Caley cinema in Edinburgh. Also in Edinburgh, the Lyceum Theatre, Traverse Theatre and the Usher Hall have been split into their own individual pages. New page for Cove thanks to Graham Kelly, plus new and archive pictures from Norrie Mcnamee for the Apollo in Saltcoats, the Arrow in Wishaw, the Radio in Kilbirnie, the Glasgow Coliseum and New Bedford, a new page for Whitley Bay, and on the Demolished Glasgow Cinemas page, the Green's Picturedrome and the Paragon. The derelict Olympia in Bridgeton is seriously on fire. Roads are closed - 10 fire engines and 2 ambulances are in attendance, and a man died after being taken to hospital for smoke inhalation. Details in the Evening Times story here. A page for Lerwick, with photos of the interior of the 1913 North Star cinema - remarkably still with its projection equipment intact! - has been added thanks to Gillian Boll, with additional acknowledgement due to the manager of the club, Alan McCleod, for his time and enthusiasm. Added a photo of The Wee Thee cinema in Hawick, and the Playhouse, Kelso thanks to Joe Skivington. Picture of the Pavilion Cinema in the Vikingaar Centre in Largs, and the exterior auditorium of the Vogue, Girvan, thanks to Norrie Mcnamee. Updated photos of the ex-Green's Picturedrome in Irvine thanks to Graham Kelly. Updated or improved photos have also been uploaded for the Johnstone, Clydebank, and Kilbirnie pages. A new page has been added for Hawick, thanks to Ian Miller, Joe Skivington and Norrie Mcname, as well as an additional archive photo of the Pavilion in Galashiels. Stewart Donaldson has kindly sent an archive photo of the Alhambra cinema in Stirling. Thanks also to Donald Kirkbryde for some additional information on some Dundee cinemas for the the database. It's exactly one year since I first put a counter on the website - and in that time, the main index page has received an amazing 11,100 hits! On average, we've been getting around 70 hits a day recently. Thanks to the launch of the Cinema Database, yesterday was our busiest day ever, with over 140 hits! The site has also grown so that we now cover 379 cinemas in 157 towns in Scotland - plus of course many more further afield as well. Now - the first two updates from items on the new look to-do list - added a page for Kelty in Fife and some wonderful souvenirs from the now sadly demolished Gothenburg Picture House there thanks to Steve Lynch, and also added the Corn Exchange Picture House in Kelso thanks to Joe Skivington (via Norrie Mcnamee). In a major step forward for the site, I'm very proud to announce the immediate availability of the Scottish Cinemas Database. This fully searchable interactive resource includes information on every known cinema ever built in Scotland, with (where available) opening & closing dates, architects and owners/circuit affiliations etc. Searches can be performed on cinema name, town, address, etc. and where appropriate, results include direct links to further information and pictures on the dedicated pages elsewhere on the website. As with all endeavours of this nature, the database is incomplete and has drawn on a number of sources of varying reliability. If you find any errors, or have any additional information to add, or any other feedback, we would be delighted to hear from you! A huge thank you must be made at this point to Helen Hopwood, who collated most of the information in the database from lots of sources over several years, and was generous enough to share it with us. As a nice side effect, the To Do List page is now automatically generated from the database as well, meaning it is always up to date with the latest information we have. If you've not looked through it recently, now is a good time for another browse to see if you have any information or pictures about the buildings we're lacking details on. If so, please get in touch! Department of hiding under your very nose: 2 more cinemas added to the main Glasgow page - the Alexandra Parade Picture Palace, and the Empire Electric. New from Norrie - archive shots of Biddle's Cinema in Annan, the Kelburne in Paisley, Poole's Roxy in Edinburgh and La Scala in Saltcoats, plus new pages for Glenrothes, Galashiels, and some additional cinemas added to the Inverness pages. Additions to the Lanark and Rosyth pages, again thanks to Norrie. Added the Breadalbane Cinema to the Wick page (thanks to Norrie Mcnamee). Added or updated pages for Penicuik, Inverness (pre-closure La Scala), Aberdeen (pre-demolition ABC) and Lochwinnoch, thanks to Norrie Mcnamee. As an experiment, we have added a search box to the bottom of the main page. This allows you to search the entire site for any keyword of interest. If people seem to find it useful, we may keep it there. Feedback welcomed! New pages for Oban, Newmilns, Granton-on-Spey, Pitlochry, Aviemore and Forfar - thanks to Norrie Mcnamee. Thanks to Frank Watson, we have added a program booklet for the Tivoli in Partick (Glasgow's Wonder Cinema! ), from May 1930. It can be accessed from the Tivoli section on the Demolished Glasgow Cinemas page, or by clicking the thumbnail on the left. New additions and updates thanks to Norrie Mcnamee for Rothesay (added the Palace cinema), Lockerbie (a photo of the Rex when it was still a cinema), Inverurie (the Victoria cinema), Melrose (the Picture Palace) and Dundee (photo of the ABC / Regal before it closed). Major thanks are also due to Helen Hopwood, for providing us with a priceless wealth of detailed information on hundreds of Scottish cinemas. Information from this will filter through to the to-do list and other areas of the site over time. A newly illustrated and very detailed history of the ex-Salon Cinema on Sauchiehall Street in Glasgow is now available. This was another building we had assumed had little of interest remaining due to the many dramatic reconstructions over its lifetime, but some very ornate original Moorish-style plasterwork arches, and much of the original Rooftop Garden Tearoom remain intact! Many thanks to Sandy Forbes and the management of the Moon nightclub for being such enthusiastic hosts for the evening! A gallery of photos from inside the Pavilion, Bathgate - many thanks to Robert Kelly for the invitation and showing us around. With perfect timing, we got there just 3 days before the cinema seats in the balcony are due to be removed to increase the space available for bingo! Also in Bathgate, some interior shots of the Regal have been kindly provided by Bill Matthews. A very atmospheric gallery of images taken inside the burnt out and long derelict New Palace cinema in Burntisland, Fife has also been added. You might wonder how much of interest there might be in a building that has been burnt out and had no roof for nearly 20 years, but the answer is - lots! In news, the Evening Times is reporting that the new owners of the Odeon Renfield Street are in discussion with several casino owners to use much of the leisure space in the converted building as a 'Super Casino' - full story here. Major updates and tidy up and rationalisation of the main Glasgow and Edinburgh pages - they should be a lot more user-friendly and nicer to look at now! Added a newspaper advert showing what films were being advertised in Greenock's cinemas in 1965. New photos for Falkirk, Keith, Broxburn, Hamilton, Airdrie, Kilmarnock and Demolished Glasgow Cinemas, courtesy of Norrie Mcnamee. Also from the mislayed for ages pile of photos - this time from Harry Rigby - I have added new interior shots on the Cowdenbeath, Dunfermline and the Leith Capitol pages. 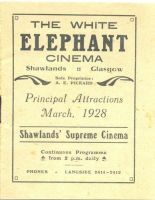 Updated the page for the White Elephant cinema in Shawlands, to have more information and the complete scans of a programme booklet from March 1928. Added some shots Alistair Kerr sent me ages ago, but I managed to mislay until now - late 1970s shots of the County, Craigmillar, the Central, Portobello, the Cinema de Luxe, Lochgelly, and the Astoria and Salon in Edinburgh. Some more shots from Norrie on the Bellshill, Linlithgow, Perth, Nairn and Forres pages. Tidied up some information on the To Do List page thanks to Kenny Duncan. Added a couple of photos from a recent visit to Prague. Some additional photos have been added to the Kirkwall page, thanks to Kenneth Thomson. A local councillor is calling for the facade of the burnt-out and long derelict Palace cinema in Burntisland to be retained in any future redevelopment. Full details from Fife Today here. Updated pages for Auchterarder, Wishaw, Hamilton and Dalkeith, and new pages for Dunoon, Castle Douglas, Larkhall, Stewarton, Bellshill and Barrhead, thanks again to Norrie Mcnamee. Added pages for Porthmadog and Tywyn, thanks to David Crooks. More from Norrie: new pages for Alexandria, Kelso, Craigmillar and Dunkeld, as well as additional pictures on the Dumbarton, Kilbirnie, Paisley, Greenock and Motherwell pages. More from Norrie Mcnamee: additional cinemas for Aberdeen, Arbroath, Bo-Ness, Peterhead, and new pages for Alva, Ardrishaig, Auchterarder, and Riccarton. All thanks to Norrie Mcnamee, have updated the pages for Aberdeen, Arbroath, East Kilbride and Leven, and added new pages for Arran, Banchory, Beith, Crief, Dufftown, Methil, Peterhead, Shotts, South Queensferry, and Tarbet. Thanks to new information from Mervyn Gould of the Mercia Cinema Society, moved the now identified Pringles Picture Palace from the Unknown page to its rightful place on the Nottingham page. More details, models and artists impressions of the proposed Sean Connery Film Centre in Edinburgh have just been published on the Edinburgh Architecture site. Added a few photos of the Regent in Brisbane thanks to Cara Strachan, a cinema in Galway, Ireland thanks to Norrie Mcnamee, and ex-Odeons in Bridgewater and St. Albans thanks to Graham Kelly. Thanks to Ian Williams of the Australian Cinema and Theatre Historical Society there are a few corrections, clarifications and additions to the Melbourne pages - including donating some fantastic interior shots of the Capitol and Regent and Plaza Theatres! Just in time to mark its complete demolition, a page for the former Cinema House in Edinburgh has been added. Brand new pages are also added for: St. Andrews, Dumfries, Annan, Lockerbie, Gretna, Moffat, Stranraer, Strathaven, Blairgowrie, Leslie, Pittenweam, Ormiston, Lossiemouth, Buckie, Callander, Elgin, Cirencester, Rushden, Workington, as well as the cinemas in the Secret Bunker in Fife and - further afield - a selection of cinemas in Nijmegen and Amsterdam (including the glorious Tuschinski). - many thanks to major contributions from Marie Smith & Sylvain Brugnot, Graham Kelly, Sue Cole, Norrie Mcnamee, and David Low for those. Updated pages include Brecon (thanks to Peter & Irene Davies for additional photos and information), Inverness (an original interior of the La Scala, thanks to David Low), Ayr (additional Odeon interior pics from Gary Painter, and some shots of the Orient on bingo from Robert Kelly), archive photos of the Parade, Dennistoun, the Rosevale, Partick and a small gallery of archive photos of some long demolished Glasgow cinemas courtesy Norrie Mcnamee), Odeon Clerk Street (with exterior shots of the front and rear of the building), the Glasgow Grosvenor and Edinburgh ABC Lothian Road, the ABC Regal in Falkirk, the Allanpark and other now demolished cinemas in Stirling, and the now demolished Kelburne in Paisley (original archive and projection room photos courtesy Andy Simmonds). Glasgow City Council today granted planning permission for the demolition behind a retained facade of the Odeon Renfield Street, and the conversion of the interior space to leisure and retail use. It must now be only a matter of time before a closure date is announced. The good news is that the plans involve reinstating a neon lighting scheme resembling the original, which once extended much further down West Regent Street than the current one does, and also removing the paint on the granite facade. Also, there is a requirement to strip out all non-original features to search for any plasterwork or other original decoration prior to demolition starting - and despite what people would have you believe, there is a surprising amount of fragments left if you know where to look! A new website with information on Glasgow's historic cinemas has been set up by Stuart Neville at www.glasgowcinemas.co.uk. This nicely designed site has a lot of archive photos and drawings, and should grow to become a useful resource (and give us a bit of healthy competition! :-) ). It should be especially useful for its coverage of buildings that are now long gone, and hence tend not to be covered on this site. In another overdue move, the site now has a proper domain name - from now on, the address www.survivingcinemas.org.uk brings you here. No need to update bookmarks or anything; the site has not actually moved and will remain available at the old address as well. This just makes it easier find, and to tell people the address verbally ! Note that its an .org.uk, not .co.uk or .com - as we're not a commercial organisation, .com would be inappropriate. Technically a .info would describe us best, but they are quite expensive, so .org is the best compromise I think! More tidying up in Glasgow: updated the New Bedford, added a couple more shots to the ABC Regal, a newer picture and details for the Odeon Renfield Street, some nice exterior night shots of the Ascot, Anniesland, and much better shots for the Coliseum. The Glasgow Theatres page has also had the Old Atheneum added to it, along with some interior shots from the Pavilion. Updated the Edinburgh Odeon Clerk Street page, to show it in its temporary guise as the Pod Deco venue. Updated and improved the quality of the photos and information for the ABC Regal, Norwood, Vitagraph / King's, Charing Cross Electric Theatre, Picture House / Gaumont, the Ascot, Anniesland, the Waverley, Shawlands and the Salon, Sauchiehall Street. Various other Glasgow pages have been tidied up a bit as well. In particular, have finally got a couple of decent pictures of the Kelvin Cinema up as well. Read about the proposed Sean Connery Film Centre in Edinburgh here- this 6 screen development would replace the current Filmhouse, and provide a permanent home for the Edinburgh Film Festival. The former King's Cinema / Vitagraph in Sauchiehall Street, Glasgow is amongst 15 buildings in the city that have been proposed for listed building status, according to the Evening Times. 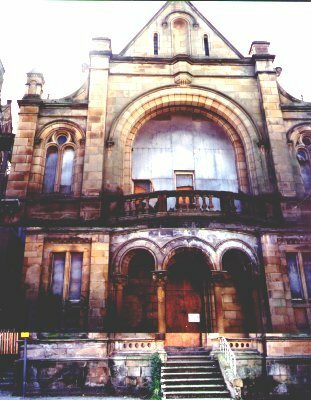 The Buildings at Risk website has now been updated with Glasgow buildings, and features the Kingsway, the Govanhill Picture House, the Britannia Panopticon, and the ABC Toledo amongst many other buildings. I've correspondingly updated this sites own list of Cinemas at Risk. Glasgow City Council has granted permission to demolish the former Kelvin Cinema - now Creme de la Creme restaurant, to be replaced with flats. No timescale known for the demolition yet (and I really need to get some better photos of it before they do!). Plans to use the former Glen Cinema in Paisley as the basis for a cinema museum are being explored. Some dead links have been trimmed from the Links page. A gallery of interior photos from the derelict and soon to be demolished Olympia, Bridgeton has been added, thanks to gap74 and turbozutek. Finally got around to plugging some embarassingly large gaps on the site, and added a proper comprehensive page for Dundee, and updated the Perth page to have some more places of interest! Added a page for the Glen Cinema in Paisley, thanks to a visit there courtesy of Martyn Robertson of Fablevision. The exhibition on the Glen Cinema in Paisley has been extended for another four weeks due to popular demand. Tidied up the References page a bit. Some more bits and pieces... - gradually getting through the backlog! Added some pre-subdivision interior photos from 1982 of the ex-Odeon Clerk St thanks to Alistair Kerr. A page for Peebles has been added thanks to Gary Painter. Pictures from inside the Phoenix in Kirkwall prior to closure have been added thanks to Kenneth Thomson. Pictures of the Orient during demolition are now available here; there's not a lot left unfortunately. Updated the page for the Theatre de Luxe on Sauchiehall Street such that the photo is of the correct building! - thanks to Ronnie Scott for the info there. Added a page for the former Queen's/Tonic cinema in Battlefield Road (now the Mission pub), and the Vaudeville Picture House on Argyle street, both places that were missing from the site before. New pages have been added for Arbroath, Brechin and Broughty Ferry (thanks to Graham Kelly), and Lochgilphead thanks to Gary Painter. 'TO LET' signs have now gone up on the Odeon Renfield Street, which will now not be closing before February 2005. Despite the temporary reprieve of Edinburgh Odeon Clerk Street building being used as a venue called Pod Deco in this years Edinburgh Festival Fringe, plans to redevelop the B-listed ex-New Victoria have been continuing. A winning scheme was chosen from three submitted, and will involve the complete demolition of the auditorium, and the building of a series of flats overlooking a central courtyard. The facade on Clerk Street will be retained, and may become a shop or restaurant. Have added a page of links to pictures of demolished Glasgow cinemas that are featured on other websites. Finally, a list of cinemas on the Scottish Buildings At Risk list is now available here. And another one bites the dust.... outline planning permission has been granted to demolish the Capitol / Bombay cinema for a housing development. No word as yet on timescales for this however. A free booklet - Cinema City - Glasgow and the Silver Screen has been created to tell the story of some of Glasgow's cinemas, and also highlight places in the city that have been used as locations in feature films. It's available free from the GFT and CCA box office, and several other locations - see www.glasgowcinemacity.com for more information. The Britannia Music Hall is having an open weekend on the 26th & 27th of June; a great chance to see inside this fabulous building. For more details, go here. Scaffolding and fencing has appeared around the long-derelict Orient cinema in the Gallowgate; looks like demolition is about to take place. See local press for programmed discussions and exhibition events. The Paisley Development Trust and Fablevision are currently directing a project which will culminate with a community cinema exhibition of artefacts and exhibits. The project focuses on The Glen Cinema, Paisley, Scotland where a terrible disaster occurred in 1929. We have created an exhibition in order to raise awareness and commemorate the 75th Anniversary of the disaster. The exhibition project includes an artist residency in the community and children's workshops for the duration of the exhibition (4weeks). The whole of Britain was horror-struck on Hogmanay 1929 to learn of the dreadful cinema catastrophe in Paisley that afternoon, in which 71 children lost their lives and over 40 were injured. About 1000 boys and girls, mostly from working-class homes, were witnessing a matinee performance at the Glen Cinema, when dense clouds of smoke, caused by a film which had started to smoulder in the spool-room, were swept into the cinema. The cry of "Fire" was raised, and the children stampeded in panic to the back entrance. This was closed, and in the frantic struggle which ensued many children were trampled and others were suffocated by the fumes. The BBC will be featuring the Glen Cinema Project on the Restoration Programme later this year. Added a page for Rothesay, thanks to Des Gorra. Pages for Wick, Fort William, Stornoway and Dingwall added thanks to Ian McIver. Bit of vintage-themed update today... and while the main thrust of this website is cinema buildings that still exist today, I'm more than happy to feature older, demolished sites if people provide the pictures and information! On that note, have added pages for the State Cinema in Shettleston, showing its demolition in 1986 thanks to Des Gorra. Photos of Edinburgh's Ritz cinema just prior to its closure in 1983 have been added thanks to Alistair Kerr. Finally, added an article on being a projectionist in Edinburgh and Leith cinemas during the 1940s, kindly written and provided by W.L. Hume. In other news, the ex-Odeon Clerk St in Edinburgh is to be used as a 5-stage comedy festival called The Pod this summer during the Edinburgh festival. This temporary reprieve prior to demolition of the auditorium should provide an opportunity to visit the building while it still exists! Updated the Help Wanted list again, thanks to new information from Darren Manson and David Fergus. Added a page for Musselburgh, thanks to the kind submissions from Harry Rigby, Alistair Kerr and Norrie Mcnamee. Added or updated pages for Kirkcaldy, Grangemouth, Inverness, Tain, Hamilton, Newton Stewart, Kilbirnie, Maybole, Coldstream, Alloa, Kinghorn, Leven, Portobello, Rosyth, Lochgelly, Jedburgh, Tranent, Angus, Tayport, Kirkwall, Thurso, Selkirk, Ballater, Dalbeattie and finally Aultbea. Thanks to (amongst others) Graham Kelly, Alistair Kerr, Frank Beattie, Findlay Munro, Harry Rigby, Norrie Mcnamee, Gary Painter and Jenny Yeomans for many of the pictures in the pages mentioned above. Added a new gallery of photos taken by Frank Watson, during the stripping out of the ex-ABC Muirend / Toledo - they make an interesting comparison to the demolition photos available here. A link to a gallery of photos from inside and outside the demolition-threatened Kingsway has also been added. Finally updated the Help Wanted list (mainly by removing things people have been kind enough to send me! ), thanks to contributions from a wide range of people. I think that I've now caught up with all of the backlog of pictures people have sent me in the last couple of months - so if you have sent me something that has yet to appear on here, please do email and prod me into remembering about it! Closer to home, the page for the Odeon Clerk St. in Edinburgh has been updated to reflect its sadly closed status, with some new photos (thanks to Alistair Kerr). The Edinburgh page generally has been updated with a few more recent photos - and a bunch of new pictures as well - many thanks to Harry Rigby for kind permission to use those. Also added a page for the Monseigneur News Theatre in Edinburgh. Added a new page for Manchester cinemas, following a nice morning wandering around the city-centre there. Also added galleries for Sydney, and Melbourne City Centre and suburban cinemas. Also, my apologies to everyone who has contributed to the site in the last couple of months - your items will make it onto here soon - I'm slowly working my way through the rather sizeable backlog! Added special pages for the wonderful Capitol Theatre, Melbourne and Hayden Orpheum, Sydney. Many thanks to Craig Cahill and Stuart Greene respectively for taking the time to show me around. In local news, it appears that Odeon is negotiating to extend its lease on the Odeon Renfield Street for a couple more years, to take it up until the planned Odeon at the Braehead Shopping Centre opens. However, the recent planning application lodged by the new owners, Duddingston House Properties, to convert it for leisure and retail use behind a retained facade, may well put paid to that. Also, at least a portion of the ex-ABC Sauchiehall Street. may become a live music venue, incorporating the original entranceway. This is the only section of the building that has yet to find a new use. Plans are also afoot to redevelop the ex-La Scala cinema in Helensburgh - plans that may even involve partial cinema use. See http://www.lascala-cinema.com for more details. Another long delay - but a major update is in the pipeline, with photos from Australia and all round the UK. Stay tuned! In the meantime, here are a gallery of photos from a daytrip to London - including shots from the film night organised at the ex-Astoria, Finsbury Park by the Cinema Theatre Association. All 1300 seats sold out for the showing of Sunset Boulevard - a fantastic night! Additionally, I've added a gallery of photos covering the sad sight of the Toledo (ABC Muirend) demolition - thanks to Gary Painter and Graham Kelly for many of the photos. If you're looking for the most recent updates, they are now to be found at the top of the page!